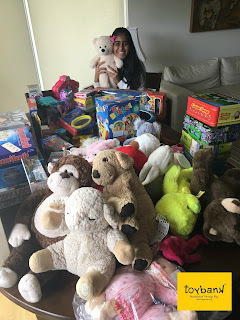 Toybank has launched its Bangalore Chapter now! Toybank had its first toy collection drive with Tech Mahindra Foundation a couple of weeks back. These toys were waiting to be gifted to those tony little hands and that's not all! Toybank had its first ever toy distribution event in Bangalore with Makkala Jagriti on 18th of August. Shweta Chari, one of the founders of Toybank joined all the volunteers for this event from Mumbai!! 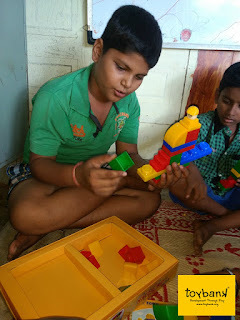 Makkala Jagriti is an NGO in Bangalore working with underprivileged children in the area of education. "After the distribution, I heard all kinds of noises from outside the centre. I ran out to check what that was, only to find a kid playing a 'mom's role' with the toy gifted to her, she was patting the toy like a kid and talking continuously with it without giving a break. I couldn't stop laughing"
Also the money donated by some of the TechMighties was used in contribution (like gifting stationery items to the children along with the toys… gift wrapping the toys to make the kids feel important and special). Toybank thanks Tech Mahindra and its employees for giving Toybank a wonderful opportunity to reach out kids in Bangalore!